Around the world we can find thousands of birds of different species. All with particular characteristics. In recent years, agapornis have been a species that has taken on more importance than it already had. This is because they are from birds that do not cost so much to domesticate, that they can adapt to the conditions in which they live. Although, you should always prioritize your freedom. There are countless articles on the internet in which they explain about care, food and much more about dogs and cats. Which are the most common domestic species. As I said, the agapornis have also become very important in recent years. It is necessary to make clear that the agapornis are ornamental birds, they are part of the family of the psitacids, a particular characteristic of this spice is that they are very colorful birds. The ease of domestication has been one of the main reasons for its growing popularity, coupled with the fact that it can be purchased for a fairly affordable price. Specifically, we must mention the papilleros agapornis. One thing is for sure, anyone who has a papillero agapornis for the first time is unaware of the care that this species requires. So all your questions will be answered in this article. In order to avoid inconvenience with your papilleros agapornis. What does it take to raise a papillero agapornis? As every domestic species needs some basic equipment, with which it is guaranteed that its stay, development and life is of quality. In the case of papillero agapornis it is necessary that the care be carried out to the best of its ability. The first thing to consider is that you need a nest so you can buy them in pet stores or choose to do it yourself. You need a heat source, two options you can use is an electric blanket or sawdust to do it. A 5-milliliter syringe is required, which is what you will be fed after you are separated from your mother. Also, it is necessary to have a cage large enough so that it can continue to grow. What is the proper age to remove the chick from the nest? This is a very important question, because the life of the chick can depend on it. 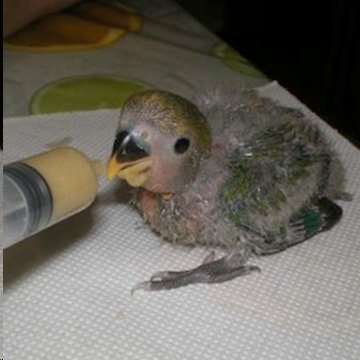 It is necessary that a papillero agapornis has a life of 20 to 25 days when it is removed from the nest where it was born. This is because he will acquire through the food that his parents give him in the food to be able to develop with the least of the possible problems. It should also not be removed after 30 days of being born, because when it is almost feathered it will be difficult to adapt to the syringe to feed. This is a point that is not for discussion. At what temperature should a papillero agapornis be bred? Another important fact in the care of papillero agapornis is that they need an adequate temperature to grow. The detail is that the temperature must be controlled very carefully, bearing in mind that this is a fundamental aspect for growth to be as normal as possible. The nest where the chick is must have a temperature between 25° and 30° C, for this is that you need an electric blanket or sawdust. You can also monitor the temperature of the nest with the help of a thermometer. What should papillero agapornis eat? It must be clear that the diet will change as it grows. After being removed from the nest, it should be fed on porridge. You can buy them at pet stores or supermarkets. Porridge may be given for up to two months. Once they are at a stage where they can feed themselves, their diet should be seed-based. How is the canaryseed or sunflower seeds of preference. How should the papilla be for papillero agapornis? The food is an important part of the papilleros, in this case its papilla must have certain characteristics so that they are easy to digest. For example, the porridge must have a texture similar to that of yogurt. It should be thick, to make digestion easier. It is important to verify that no lumps have formed. This must also be considered to be at room temperature. The porridge should be prepared with bottled water or tap water that must be boiled beforehand. All this is important to do, because it ensures that the chick develops smoothly. As well as avoiding possible infections. How long do you have to stop feeding him porridge? Food is indispensable in any species. Only that when being in captivity their feeding must be induced, that is to say, that they will have to get used to always having food and not having to look for it. Like they'd do it when they were free. They feed every five hours. The process to stop feeding porridge should be progressive. I mean, you're not gonna take this kind of food away from her overnight. You won't be able to remove the porridge completely until you make sure it eats seeds or other food you're giving it. As a recommendation, you can even alternate the porridge and the seeds, until finally the agapornis can eat on its own, without the need for you or the syringe. This is a great past to be able to keep the bird growing naturally. Once the bird is young, it will be able to feed on millet, bread, breeding pasta, branching bread, vegetables such as lettuce, chard, bananas, apple, carrot, broccoli, mango and seeds, of course. How should I clean papillero agapornis? Hygiene is a fundamental part. When you are still a chick you should not bathe, only clean the nest and sawdust every two days at most. The remains of the porridge and the beak should be cleaned. Wet wipes are recommended or a good alternative.